Oscars has been sold by the Australian owner to other Australians. 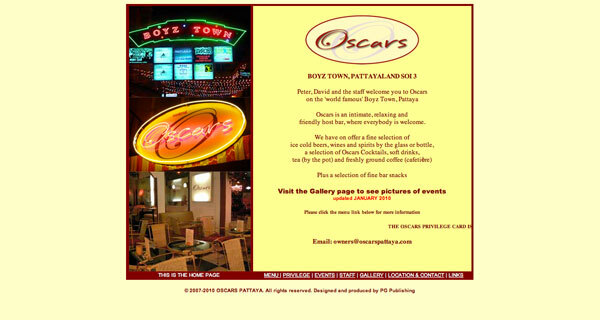 Oscars very popular and full of friendly host boys. I like Oscars in the early evening viewing BT getting ready for the nights activities with boys arriving for work. They have a selection of items upstairs Jocks etc if you into that sort of thing. Jocks or jocks? A jock is an athletic supporter but a Jock is a Scotsman, same same as Scottish guy. Yes what a difference the case of a letter makes. I don't think Oscars has a selection of Scotsman upstairs - not usually anyway !. boys than before but the number varies nightly, sometimes too many. The free sausage sizzle is back and restarted this weekend. Did you spot any boys who made your sausage sizzle? I used to enjoy having a drink at Oscar's and watching the 9.00pm BBB's parade but sadly no parade now. that broke the camels back. Unhappily true. I had been told by a Boy who is now working in Jomtien complex. Once the lights go out, they often don't come on again. I hope this is not the case with Oscars.